Balance bikes are an essential part of childhood, as not only do they help children learn the principles of riding a bike they also look great in the playground, at the park and zooming around the streets. Balance bikes are available at a wide range of budgets, and the good news is that you don’t have to spend a fortune to get a good quality bike. The cheaper bikes may not have all of the bells, whistles and luxury features of more expensive models - but you can still get hold of some good looking and functional bikes for prices ranging from £25 - £30 and upwards. We love a comparison table on this website, so we have provided the table below to highlight five of the best cheap balance bikes available on the market today. Our first recommendation is the Chicco Red Bullet Balance bike, which is incredible value as the bike is generally available for around £30. This is a great option starter bike for children aged between 2 and 3, as the lightweight nature of the bike (weighing just 2.7kg) and the low saddle height means that it is easy to handle for smaller children. 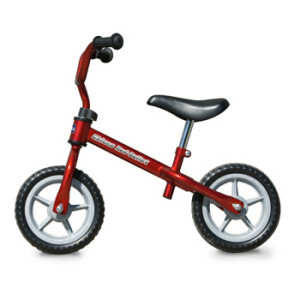 The Chicco Red Bullet Balance bike is equipped with a metal frame and features an adjustable seat and handlebars. 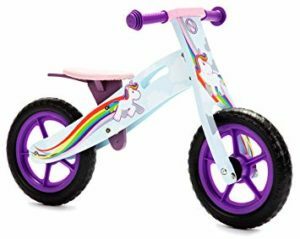 If you would prefer a wooden balance bike in this price range, then look no further than the Nicko Unicorn Rainbow Bike. This bike is made from birch plywood, so it is great for the environment and also looks great with pretty painted unicorns! The saddle height on this bike can be adjusted at either 35cm or 38cm, so it is ideal for 3 year olds just learning to ride. 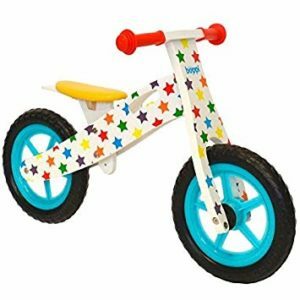 If your child wants an alternative to unicorns, then another great wooden balance bike in this price range is the Boppi Wooden Balance bike. This bike has a choice of several exciting designs, and it weighs just 2.5kg so this is one of the very lightest balance bikes on the market. 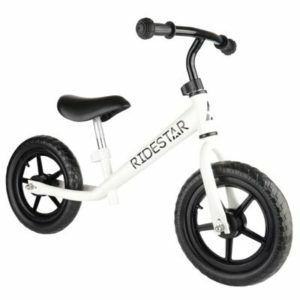 Another great option in the £30 price bracket is the Ridestar balance bike. This bike has quite a basic appearance, but it has a BMX style and is available in a choice of 4 classic colours. Features include a lightweight tubular steel frame, puncture proof tyres and a padded seat which can be adjusted from 32cm – 40cm. Our final choice is the Banana Balance Bike. 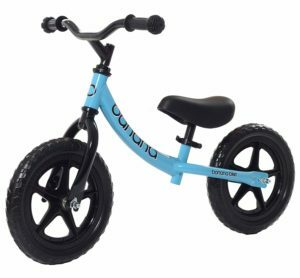 This is slightly more expensive at around £37.99, but this is one of our new favourite balance bikes with a banana shaped frame which helps young children to get on the bike and also looks cool! The 2019 model is new and improved with a twin bearing headset for smooth steering and and improved tread pattern for better grip on the tyres. This is a great value bike that is amazing value! These models show that you can find a great quality balance bike on a limited budget, although if you can stretch your budget to £50 and above then you open up the choices to a greater range of bikes including Bike Star, Kiddimoto, Puky and even a Strider. Don’t forget you will also need to invest in a kids safety helmet as well if your child is going to be out on the pavement or cycling on tarmac. We hope this helps you choose the best budget balance bike, and if you are shopping by age group then check out our recommendations for the best balance bikes for 2 year olds, 3 year olds or 4 year olds.